It's been a while since we broke out the rods and pins of a nice new Technic set, so when we heard LEGO were to bring out a whole new series of the construction sets, we had hoped for something meaty. And by golly did we get it. Reviewing the second biggest LEGO set we've ever built, we check out the Crawler Crane #42042. This is a huge set; the second biggest that LEGO have released in their Technic range this year. There are 1401 parts all told, including some that are new and exclusive to the Crawler Crane, as well as a battery pack and large motor. That is because this baby is powered! Lets take a look shall we? Thar she blows! This thing is so big we couldn't photograph it in the normal place we do all out LEGO reviews, hence the rather dodgy dining room rug of Test Pit Towers. See that little white blob at the bottom? That is a normal-sized minifigure to give you an impression of scale. Not only is it very tall (70 cm at the max), it is also very bulky and heavy. This might not fit on your usual LEGO shelf. In terms of the build, it took us about seven hours to complete. The trickiest and most time-consuming part is that huge gear mechanism in the rear of the crane (more on that later) which includes several dozen cogs and gears all precisely arranged. But despite the complexity of the design, we actually found it was a joy to build. With so much going into the model LEGO really took their time with the instructions, often giving over an entire page to the placement of one pin, just to make sure you get it right the first time. The only part of the build that was slightly monotonous was clicking together 90 individual track parts on the base. But once done, look how awesome it is. Yes, big tracks, but very necessary. One of the motorised functions of the Crawler Crane is forward and backward motion, so big grippy tracks are a must. They also have to be long and widely set to keep the crane upright when lifting heavy loads. ...power the gears. All four types of movement are controlled here, by way of a very clever sliding stick mechanism. Slide one of the two sticks to the left or the right, push up or pull down to engage the gear, then hit the power button. If you look closely you can see that the Crawler Crane can raise and lower the boom arm, move backwards and forwards on those mighty tracks, spin 360 degrees in both directions, and finally raise and lower the grabbing claw. The claw is a thing of beauty. Yes, it is manually operated by way of the little screw knob at the top on the right, but it still works incredibly well. The centre of the claw uses a concealed screw part which, once you start to twist the knob, will either lift or lower itself, drawing the claws stiffly together or apart. The whole unit can also be easily removed (to be replaced by whatever) by pulling out two small black pins. And as you can see, that claw can travel quite far. When placed on top of a table, and with the boom arm lowered to the maximum and the claw dropped to the full length of the string, if can reach the floor. This can then be fun to pick things up and hoist them away. We did try to snag the cat a couple of times, unfortunately to no avail. 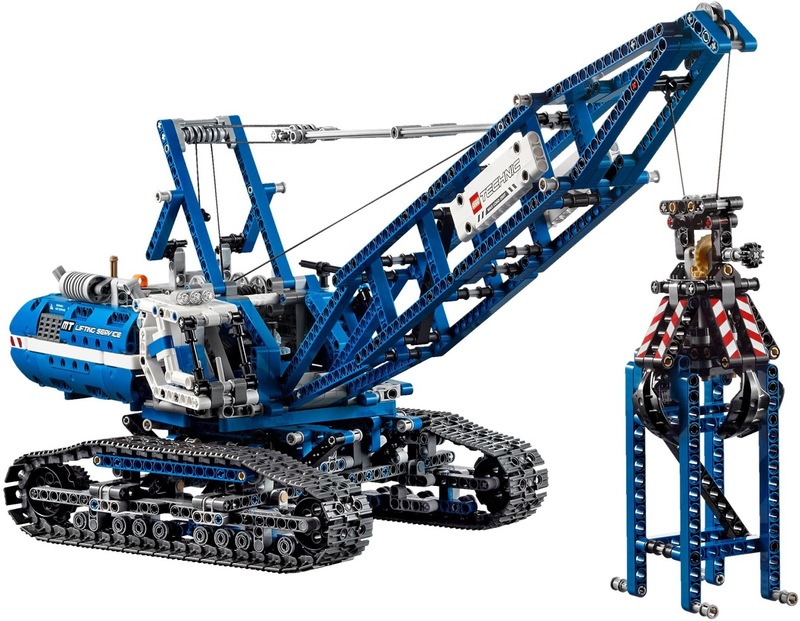 The image above does serve to demonstrate how much of that tough black Technic string is included with the Crawler Crane, and we were thankful that LEGO didn't go down the route of "that'll do" and supply it only with a couple of feet. quite slow to deploy and re-reel, but we assume this is because the few gears and cogs between them and the motor are so set to make them as tough as possible. The torque of both is quite impressive, and when working together (both can be set to work simultaneously - as can the drive and rotate actions) they can lift quite the weight. In fact the Crawler Crane is so strong it can lift things heavy enough to tip it off balance. Hold down the rear section while hoisting and you can lift a few pounds of weight. Similarly the other movement features were just as robust. When set to rotate the Crawler Crane won't stop for much, forcing itself with enough strength to knock things over with that long arm. Also the drive mode, while a bit juddery, pushed the crane forwards (and backwards) at a fair old pace, and the tracks meant it could conquer most LEGO-based terrain we threw at it. ...air vents, a big exhaust, and some subtle yet appropriate stickers. Also, the main colour scheme is blue and white, not yellow. Yes, a LEGO Technic construction vehicle that isn't yellow! Imagine that. It's happened baby! We didn't notice it until about half way through, after wondering why the growing model was so refreshing to look at. No yellow. Yay! More please, Mr LEGO. One extra thing to note about that huge boom arm: you actually complete the model with it being a bit shorter, then have the option to build another section of the boom, to use either use as an object to lift, or to include in the model itself. Obviously we chose to make the crane as tall as possible, but the option is there for you. To see what it looks like with the extra section off, check out the intro image at the top of the review. We've had a tonne of fun with the Crawler Crane, both as a part of the build itself, and by playing with the finished product. As we said, the build itself wasn't too hard (thanks to the well thought out instructions) but after letting our four year old reviewer have a go with it, it is clear this is designed for older kids. Fathoming out the gearing controls on the rear of the crane took her quite a while, and learning how to apply just the right amount of pressure to the shifter sticks was also a learning curve (needless to say there have been a few emergency repair jobs). Bear that in mind when buying the Crawler Crane for young kids - it might frustrate them a bit to begin with. That said, as toys go this is pretty incredible. The build wil get kids thinking about gears and clockwork mechanism, while playing with it will help with spatial awareness and... oh, who cares about all that crap? THIS IS AWESOME! We might put some guns on ours.